Qin Ming was a commander of all the imperial forces around the town of Qingzhou known, on account of his temper and of his loud voice as the ‘Thunderbolt’. His favourite weapon was a ‘wolf-toothed’ mace (ryōgabō). By an involved series of ruses and appalling treachery, he was induced to join the rebels. In this print he stands holding the ‘wolf-toothed’ mace, beside the castle wall, being mistaken for a brigand. This is not a preparatory sketch for a print, that sent to the blockmaker, a shita-e, for these were extremely sketchy, and the block-cutter had a very considerable input to the final design, controlling all the details. 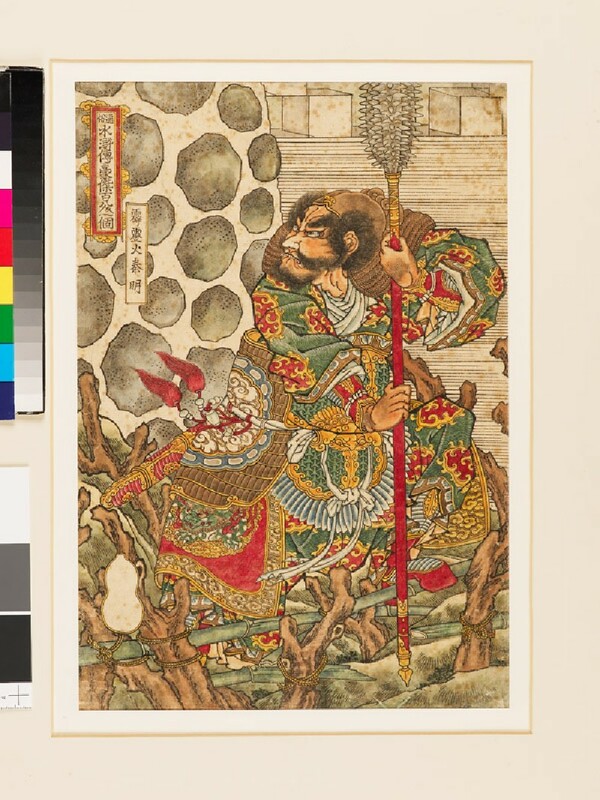 This is a worked-up drawing; possibly by Kuniyoshi with assistants, perhaps as a demonstration for a publisher or possible patron. Nine similar paintings of other heroes are known, all in the National Museum for Ethnology, Leiden.